50.000 $ as openng bid, that's a very cheap price. I'm somewhat suspecious about the fact, that the copy says it's in running condition, yet it's shown with a tow cable (which, on the website I linked to, can be seen connecting to a recovery vehicle). No it doesn't. If I bought a car in running condition I would expect to be able to take the key, put it in the ignition, start the engine and move it. Running condition means that it will run under its own power, not "You can drag it around if you've got something big enough to pull it". Heck, I know from experience I can push a Ford Galaxy myself, I wouldn't sell one I had to do that with as being in "Running Condition" though. If it can't be moved under its own power it's suitable for static display. I would agree with Simonr on this one, if its advertised as Running Condition than the engine should be functional, perhaps someone should ask them if it actually runs? Kind of full circle in a warped sort of way. Weren't they first called "tanks" as a deception and in reference to ether septic or water tanks? Interesting picture by the way. Thanks for posting it. The T34 probably just has a lot of German soldier residue stuck in the tracks and wheels. Once you hose that out, it should work just fine. Mind you, my armored vehicle mechanical expertise is only theoretical, but having seen a number of movies on the subject I'm sure this is the root of the "running condition" problem mentioned above. 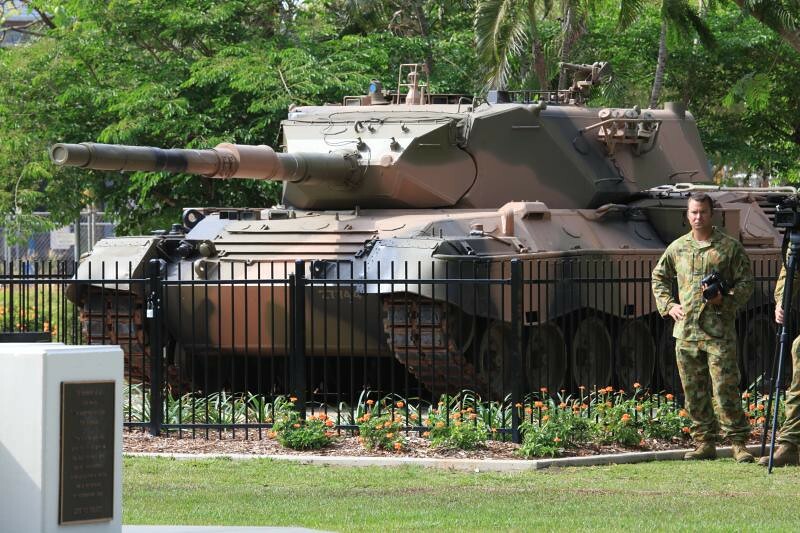 You have a Leopard tank defending your supermarket? In Oz? From what? Ozstraylia has more than its fair share of weird and dangerous critters. Snakes, Spiders, Crocodiles, Sharks, Jelly-Fish, Octopus, Coral, Wallabies, Kangaroos, Lorry drivers, not to mention Rugby players. It's all "buyer beware" down under.